November | 2014 | H.A.W.K.S. 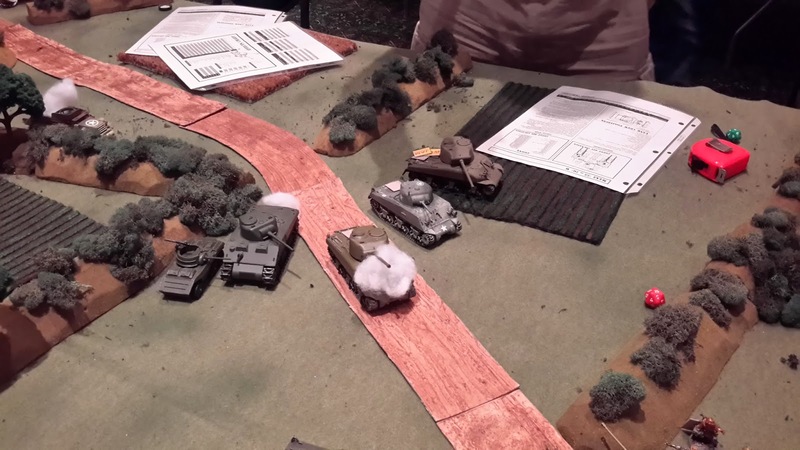 Here are a couple shots from the Battleground games I hosted at Historicon 2014. Unfortunately, I usually get too caught up in the games and forget to take pictures. 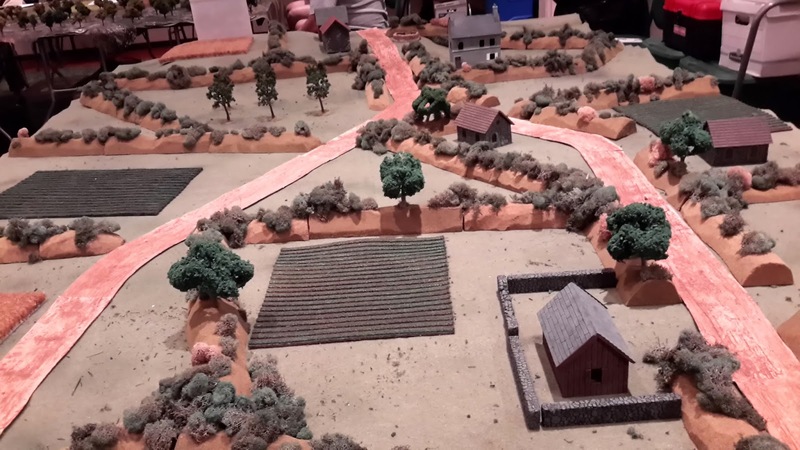 The three linked scenarios were from the Skirmish Campaign series and focused on the fighting around Haut Vents (near St Lo) July 1944. All three games were played on the same table. 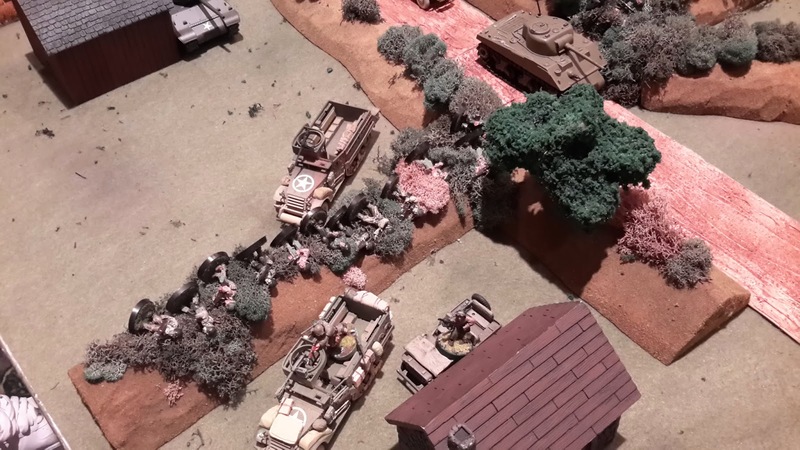 Destroyed vehicles remained on the table from game to game. A view from the German defenders point of view from a top Haut Vents. A view from the attacking American point of view. The three linked scenarios represented the initial American attack, the German counter-attack, and the American counter-counter-attack. 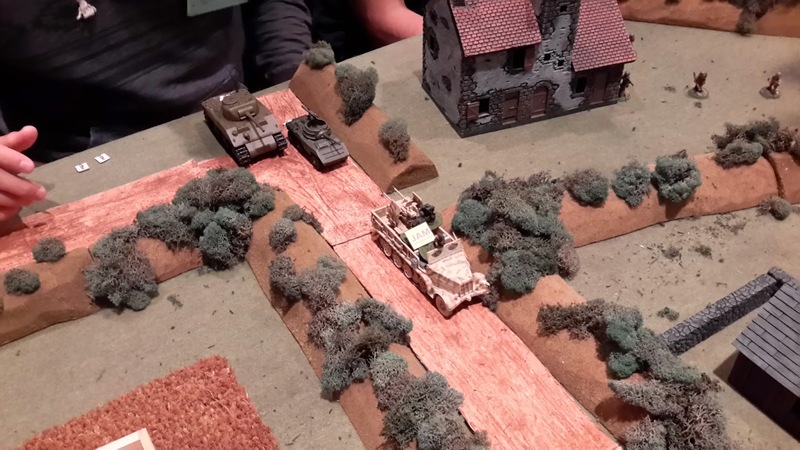 A panzerfaust in ambush takes out an American halftrack and half of the squad it was carrying. 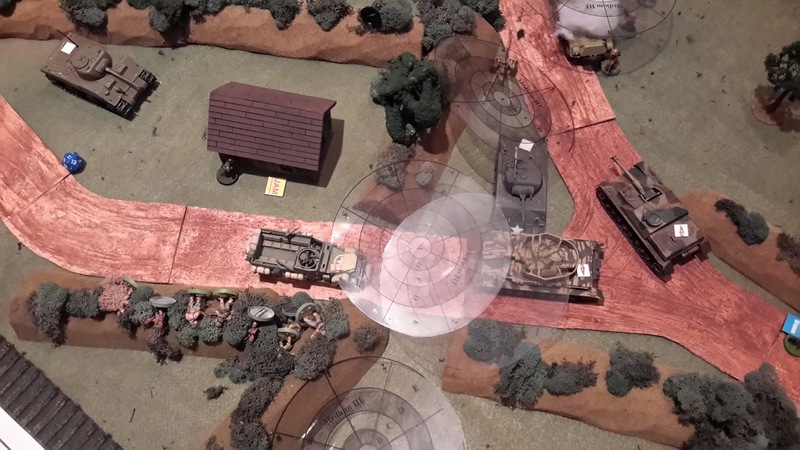 During the second scenario, elements of Panzer Lehr push forward to blunt the American attack. 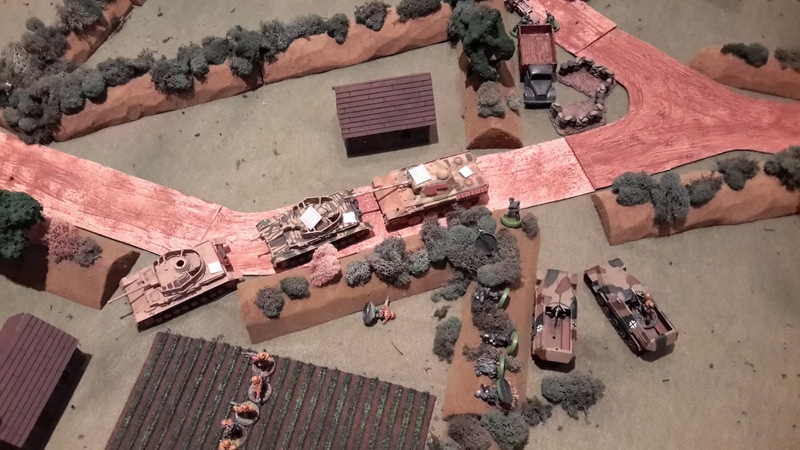 …..and runs into the awaiting German armor. Supporting American artillery scatters wildly off target and hits friendly units as well as the enemy. 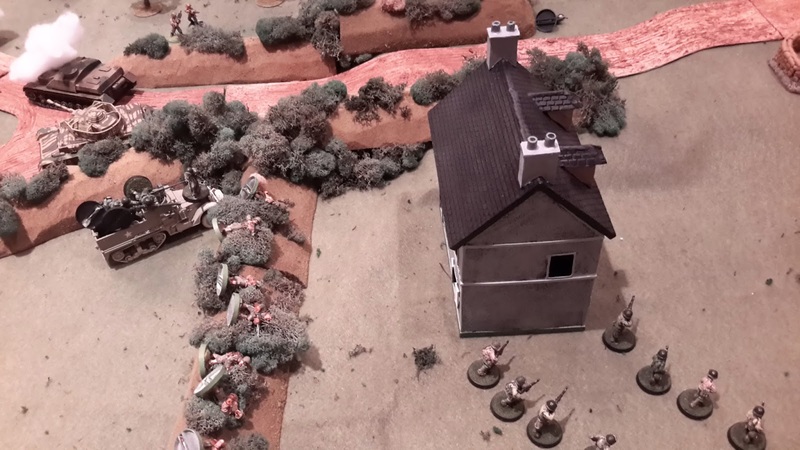 The final American assault on the objective at the summit of Haut Vents. Overall a great series of games that were enjoyed by both sides. But running three games back to back on the same day (9 am – 11 pm) while rewarding was really exhausting. DonHello, just adding my blog to the HAWKs family. 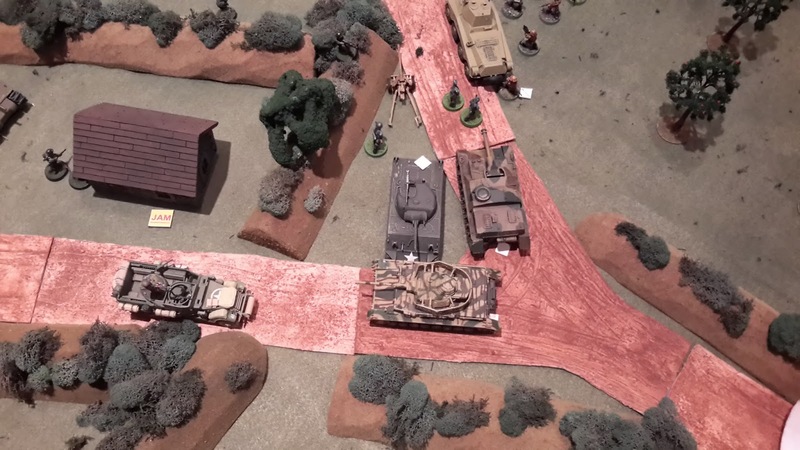 My weird WWII game with Germans on pterodactyls, Americans on giant eagles, and Brits on griffons. I still have a little work to do on the griffons and the German “bomber” before this is ready to put on the table. A Robin Hood game to try out Howard Whitehouse’s Outlaws of Sherwood rules. 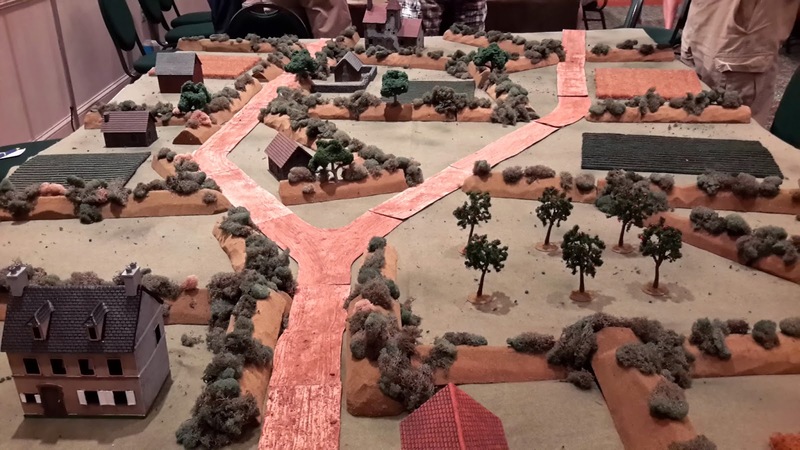 I haven’t had my French and Indian War stuff on the table in a while, and I am just about done painting all the Acheson Creations terrain from their Kickstarter project. I haven’t put my Mexican American War figures on the table in a long time. I have been collecting Plasticville buildings to flesh out my town of Granville for some pulp gaming. I haven’t had my cowboys on the table in quite a while. I haven’t run a Victorian science fiction game in a long time. I haven’t put the zombies on the table in a while either. So with all those projects ready to play or nearly ready to play, I haven’t felt compelled to start a new project. So, I have I have been whittling down my unpainted lead mountain. (Actually compared to most gamers, my unpainted lead mountain is more of a mole hill.) Two weeks ago I pulled the last of the Battle of Five Armies figures out of their hiding place and began painting them. I have recently finished another 12 bases of goblins, some giant spiders, flocking bats, and giant bears as well. I also primed and mounted on popsicle sticks several sets of Copplestone 10mm figures that I bought from RLBPS a couple of years ago. The orcs, half orcs, and goblins are on the painting desk along with two units of 28mm plastic British I will paint for the Northwest Frontier. While there is no danger of this occurring in the near future, I am really whittling away at the unpainted lead. This winter my daughter and I are going to finish repainting a bunch of Plasticville and Litko buildings and also work on our stores for the club zombie shopping mall game. This weekend, I found one of the “Toobs” at Michael’s that I thought had use in a 10mm ancient or fantasy game. It is a set of famous world landmarks. The ones shown on the right of the picture will fit nicely on a built-up area on the table. The ones on the left are probably not usable. Big Ben is in the gray area. This week I took a break from painting Goblins, and instead worked on Shaeress, the Dark Elf Queen, from the BBEG set. I hadn’t looked up this figure in Reaper’s webstore before I painted it, (I feel seeing painted examples of a figure before I myself paint it, has the potential to sway my own ideas on color scheme.) so I didn’t know she was a Dark Elf. If I had, I might have chosen a different color scheme, and gone for a more Drow look to her skin and features. As it was, I wasn’t sure what I was dealing with when I first studied this figure. She seemed to be in finery that was torn and tattered (The best I could guess from the sculpting. This is another one of those figures that I sometimes had no idea what I was looking at on the figure.) So, I imagine that she was some sort of Elf princess that had fallen under a dark influence (So I wasn’t too far off). Now, I find my go-to palette when painting Bad Guys, is more often than not, red and/or black. So, with this figure I decided I wanted to do something different, so I thought I would go for a kind of sickly, swampy, green look. This color scheme would also fit into my mental idea that she was some sort of fallen elf. I prepped this figure in the usual way; soaking it in a dish of water with a couple drops of dish soap added, then giving it a light scrub with a soft toothbrush, and then rinsing and drying. I then glued the figure to a 1” black-primed fender washer with Aleene’s Tacky glue, and glued the washer to a tongue depressor with a couple drops of Elmer’s White Glue. I began painting by giving her a wash with thinned black ink with a tiny pin-point drop of dishsoap added to help it flow into the crevices and help show the sculpting outlines. I then painted her skin with Folk Art “Milkshake”. Next I panted her stockings and sleeves with Americana “Olive Green”, and her skirts(?) with Accent “Forest Green”. My next step was to paint her armor, hair-ornament, and shoes with GW “Brazen Brass. There were two straps on her left wrist that I painted Apple Barrel “Apple Black Green”. I let all this dry, and then gave the entire figure a wash with GW “Agrax Earthshade” wash.
After the wash had time to dry, I came back and painted her hair black. When the hair was dry, I gave it a light drybrushing with Duncan “Slate Blue” to add highlights. I then added eyes (white with black pupils), and lips with Folk Art “Burgundy”. I then highlighted the skin with the base “Milkshake”. Next, I highlighted the sleeves and stockings with the base “Olive Green”, and the skirts and wrist straps with Americana “Forest Green” (A slightly lighter shade than the original Accent “Forest Green” I had used.). Finishing up, I added highlights to the armor with Ceramcoat “Bronze”. Lastly, I painted the white areas of the figure’s integral base with Americana “Asphaltum” to hide the white Bones material before flocking. I let the figure sit overnight, and the next morning I gave it a coat of Ceramcoat “Matte Varnish”. Later that afternoon I flocked the base, and the next day I sprayed it with Testor’s “Dullcote” spray varnish. I’m generally pleased with the figure. I didn’t particularly love this figure (I found trying to figure out the details of her outfit frustrating) so I just did a quick and simple paint job on it. In addition to finishing off some Saxons today, here seen with the flocking and final varnish coat, I also finished a handful of figures from my Bones stockpile. The curious base to the right is a Reaper 77099 “Nightspecter”. I’m thinking it might be used as an objective marker on the table (or a wall of skeletons). The green lady was done up that way in acknowledgement that most people thought she looked like an alien due to manufacturing issues (one of a handful of problematic figures from Bones I). The barbarian on the left was a speed painting exercise, at about at hour. 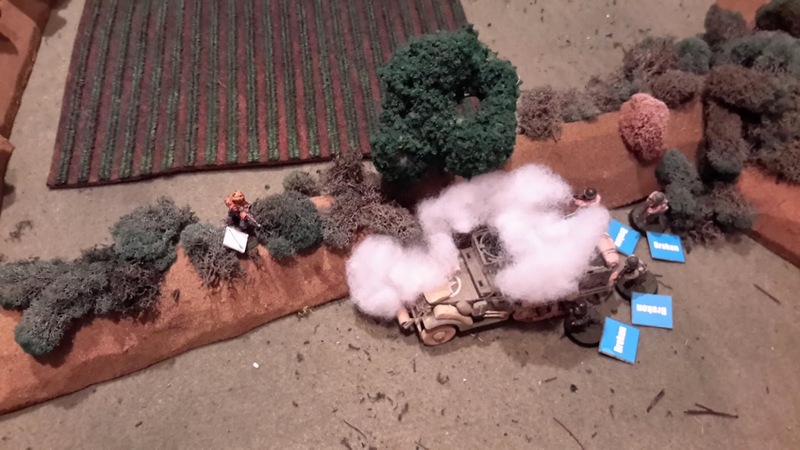 Chris hits a camel which is draped over the hood of his truck…. Chris hits a camel which is draped over the hood of his truck. Geoff in the tower with a damsel in distress shoots into the melee.